There are some large images on this page. When opened, use your browser's scroll bars to move around and and use the <back> button to return to this page. The approximate present location of the College buildings is marked in red. There are many differences as far as the roads are concerned, both in terms of existence and route, and it is possible that the ability and diligence of the surveyors may account for this, to an extent. 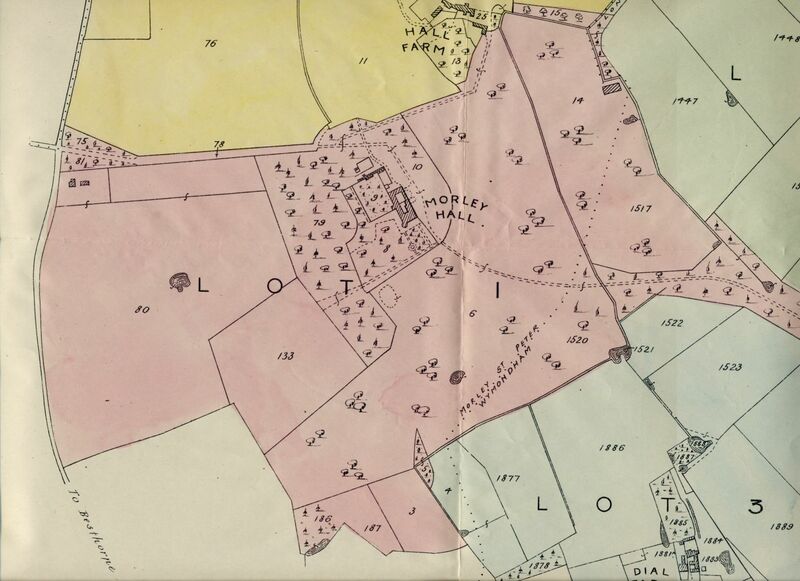 The present road now known as Golf Links Road did not exist on the Faden map. Both of these Norfolk maps have been re-published by the Larks Press and are available from Amazon. The books include comprehensive introductions that evaluate and comment upon the maps' features. 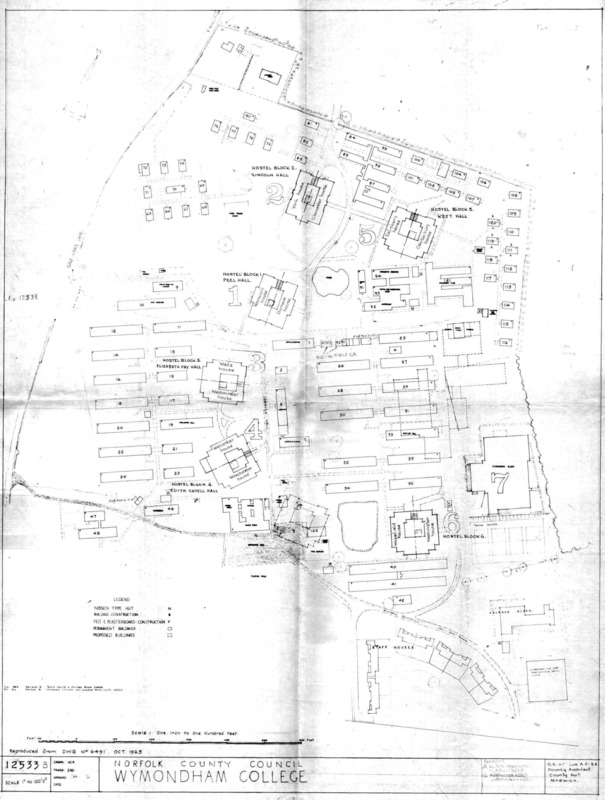 Early in 2001 I was given a very smudged photocopy of the original Morley USAAF hospital map. It took several days of laborious effort to scan and clean up the image with the aid of Adobe PhotoShop, but in the end I had a reasonable file to include on the web site and to pass on to Roger Garrard for inclusion in the 'First Fifty Years' commemorative book. "I don't know if you recognise the name, but I must claim responsibility for copying the hospital map from the original print to the present format. I did this at the end of my 5th year, after finishing O-levels, and stayed on for a few days to copy the map and do some other helping out in the Technical Drawing department." 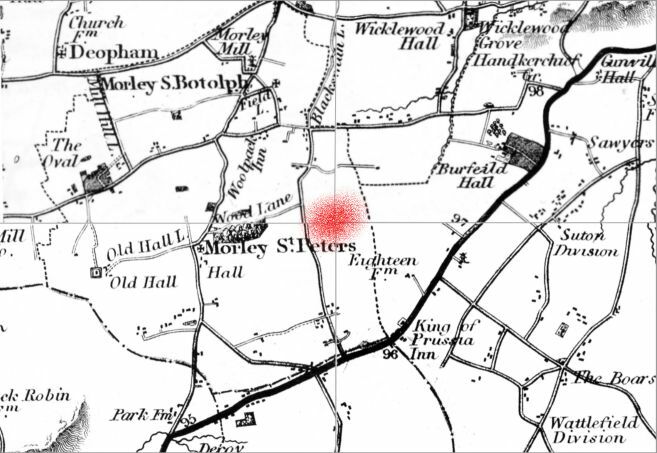 ● Clicking on the graphic at left will open a large map image (190 KB) of the Morley Hospital, redrawn in 1973 by Steve Grant, overlaid with the subsequent hut numbering scheme and the outlines of modern buildings. ● Before opening the map, it's suggested that you first print off this information on Hospital building code numbers. 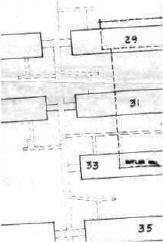 The map shows the buildings that existed in October 1963 and, in addition, outlines of 'proposed' new construction. Those who are familiar with the present layout of the College will see that the latter projections didn't materialise in the intended form - notably a 7th accommodation block to fill the gap between Cavell Hall and New Hall! There are errors too; for example the York and Gloucester labels on Lincoln Hall are the wrong way round. ● why does each hut have a path and a side door just off the covered way (as shown below)? The original huts (wards) had only coke stoves. When the boiler houses were added, and there was a need for more pipes to be run to the huts, perhaps the side doors nearest to the covered way became a suitable inlet route. ● what are the shaded boxes in each Hall courtyard? Answer from Norman: regarding the shaded area in the house courtyards I will hazard a guess that they were where the boiler room was (which was down some steps outside the kitchen in the courtyard). I have circled this in Red! Can anyone else confirm this? 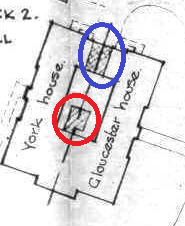 The shaded area circled in Blue is, of course, the arch where we entered the house (there was a shoe room just inside the arch to the left for York and right for Gloucester where we changed our slippers for shoes, I wonder if they are still there). ● why does Cavell have an extension on the dining room? ● Another strange feature is the group of huts that include the library. When I started in 1967, Hut 7 was the History Department and not Needlework, and there was a hut at the back of it parallel to the Library (used for R.E.). It is not shown on any plan seen to date. I think you solved this one yourself Steve! The hut behind the Library was built from the remains of hut 39 during the 1964/65 school year and there is a photo of its construction here. It also appears on the 1967 aerial photos. There were variations between the dormitories, even though the majority were original hospital 'general' wards (26 and 27 were specifically for Officers). 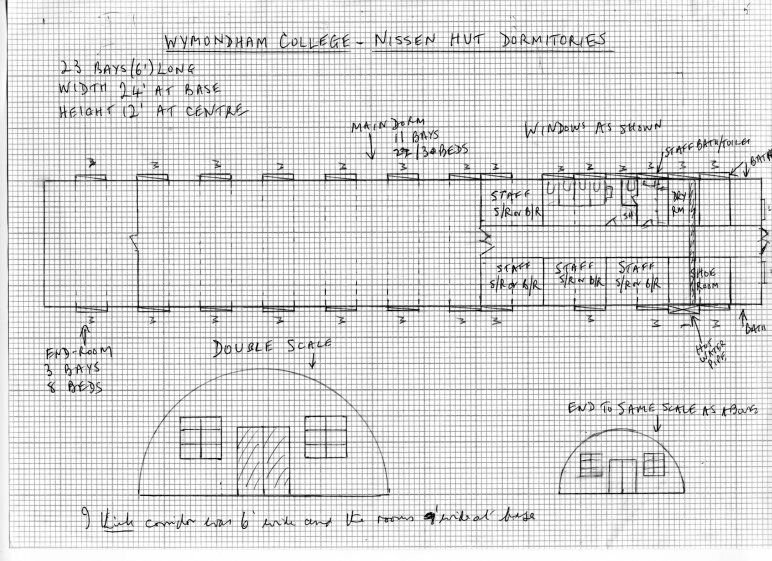 Roger Garrard was West Housemaster from 1954 and this plan represents his present-day recollection of the general dorm layout. ● Click the image to view the full-size plan (146 KB). 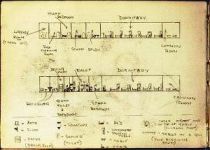 50 years ago, Dave Turner sat in Butler 26 and sketched the layout of his surroundings. His notebook has survived, so we're able to reproduce the drawing here as an authentic record of where our first students lived. ● Click the image to view the full-size plan (109 KB). This plan was drawn from memory by Maurice Jackson. His associated recollections are on the Life in the Huts page. ● Click the image to view the full-size plan (129 KB). 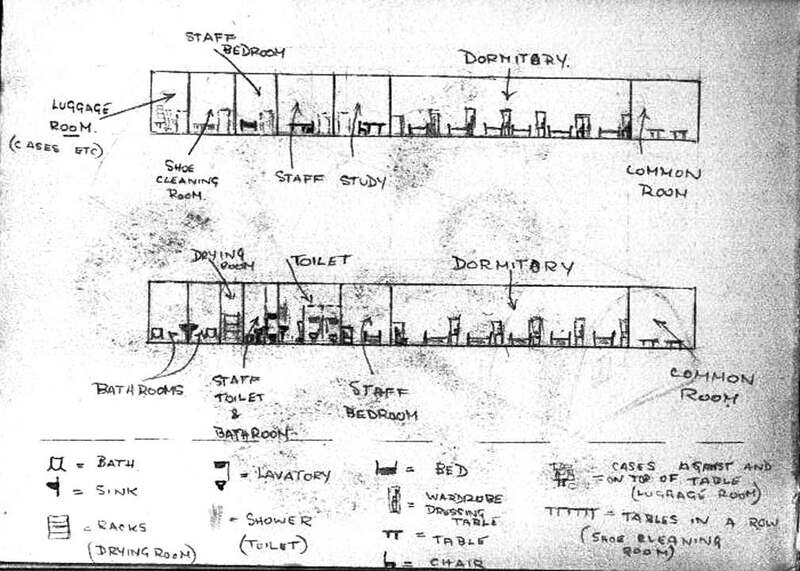 John Chapman's memory had to reach back 45 years in order for him to draw this plan of his first dormitory, Butler 34. John says: "The bedroom thing etc. is a bit vague but someone else might remember those bits. I can 'see' the suitcases somewhere but not exactly where. The Skiffle group operated in the cleaner's cupboard and it was quite noisy ... maybe the early beginnings of my tinnitus!!!' We were in the shoe locker room one night and someone had a Sunday Pictorial (tabloid) with VIRGIN BIRTH as the huge front headline. Don't think anyone knew what it was about, but when it was confiscated we knew it must be a bit 'rude.'" ● Click the image to view the full-size plan (56 KB). Dave Turner adds: "My photos show that each boy had a bed, chest of drawers with mirror, side table ( located between the heads of the beds ) and a wardrobe. I had forgotten that there was a slope into the hut entrance but John's right. The common rooms were originally filled with chairs and sometimes a table tennis table, but later became sleeping areas as they crammed more boys in a dorm. There was a shower (single) to the right as you entered the 3rd loo and 3 sink room. The drying room was our hang-out because it was the warmest place to be! I actually did my sketch when I was in that dorm so I think it is pretty accurate 'cos I was in training to be a geek (!) and finished up a engineer." 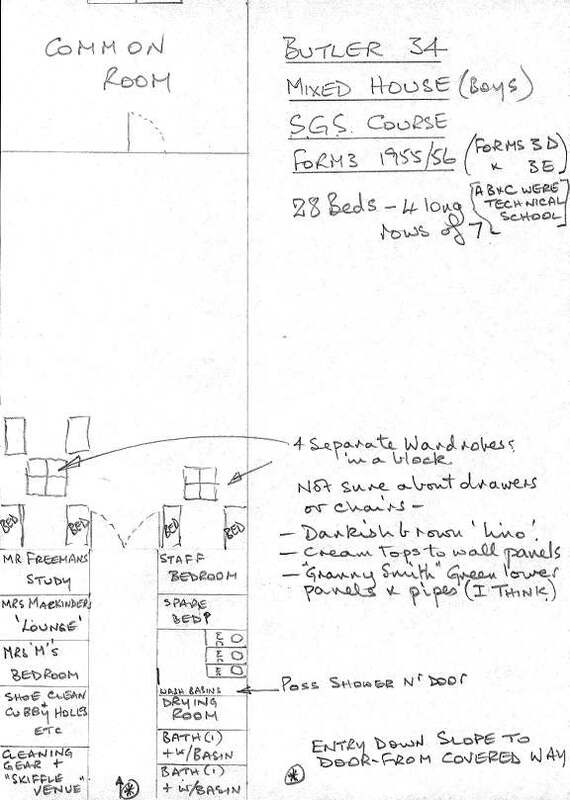 Another plan from Maurice Jackson, who said: "The one feature that distinguished classroom 38D (my 1st Year form room) was the presence of a small flat-roofed brick storage shed which overlooked the rear windows of this room, and was only about 8-10 feet away from the back. After year one our form room was either 36C or 38C. The A stream occupied B, the B stream occupied C and the C stream occupied D (all in the same Year naturally). Of course individual lessons could take place in any of the classroom sections and, after having been given our timetable, it was easy to memorise where we had to be for our next lesson. I have an idea that classroom 39 was used as the tech. drawing office before the path. lab. [USAAF Morgue - Ed.] became available. In some cases the B and C groups were combined for the same lesson, notably Botany/Biology and PE." Buildings 91-94 were used for metalwork, woodwork, domestic science, technical drawing and engineering science. This plan has been drawn by Colin Farrington as an initial outline for discussion. 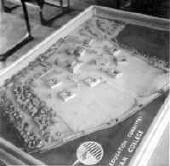 This model was made at the end of 1958 to show how the College would look on completion of the intended building programme. It was featured in an Eastern Evening News article in May 1959 (here). This map and guide were issued to pupils in 1978. 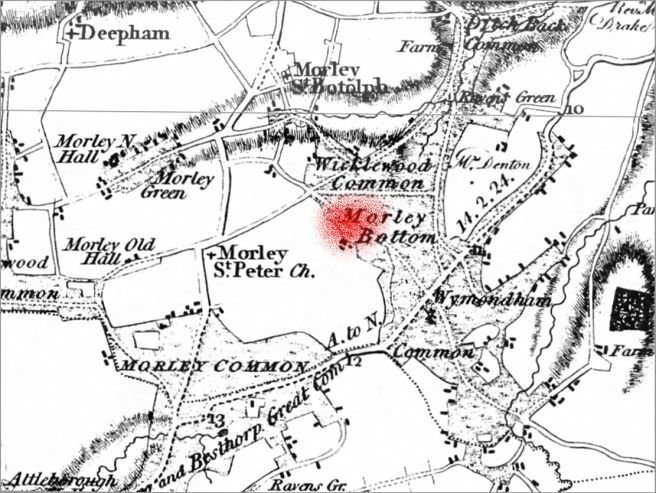 The original map was drawn by A. Hawes and S. Turner of Course 63 in 1973. ● Click to enlarge (121 KB). 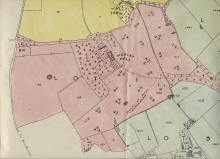 The Norfolk County Council E-map Explorer web site provides more images from 19th Century ordnance survey maps, tithe/enclosure maps and aerial photographs taken in 1948 and 1988 (use post code NR18 9SZ). We cannot reproduce the images here because of copyright restrictions.